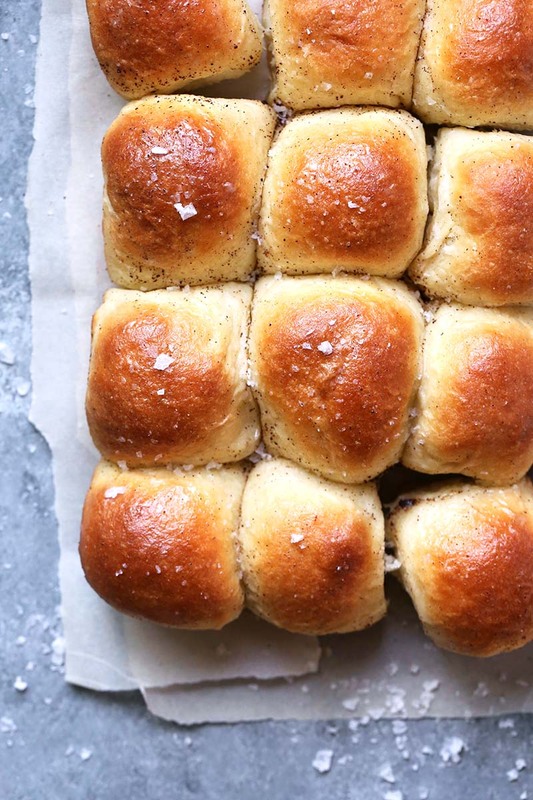 These soft and fluffy brown butter dinner rolls bake up golden and delicious, perfect for any holiday meal or weeknight dinner! Combine 2 cups (280 g) flour, yeast, sugar, and salt in a large mixer bowl fitted with a flat beater/paddle; mix on low speed until incorporated. Heat buttermilk in a microwave-safe measuring cup for 45 seconds to 1 minute, until very warm, but not too hot to touch (120-130°F). Add warm buttermilk and solidified brown butter to flour mixture and mix until combined; mix in remaining 1 cup (140 g) of flour. Switch out the flat beater for a dough hook, and knead dough for 5 minutes until smooth and elastic. Place dough in a medium bowl coated with cooking spray and cover with plastic. Let the dough rise in a warm place until doubled in size, about 30 minutes. Spray a 7x11-inch baking dish with nonstick spray; set aside. Turn out dough onto a lightly floured board. Shape dough into a ball and use a sharp knife to cut into 12 equal portions. Roll each piece into a ball, gently stretching the dough over itself and pinching together at the bottom. Place rolls in baking dish, cover with plastic, and let rise for 25 minutes or until indentation remains after lightly touching dough with finger. While rolls rise, preheat oven to 400°F. Brown the butter for topping: Cook butter in a heavy saucepan over medium heat, stirring constantly until it foams, turns clear, and then turns a deep brown. Pour into a glass measuring cup and let cool slightly. Use a pastry brush to gently brush risen rolls with half of the brown butter. Bake rolls until golden, about 20 minutes. Remove from oven and immediately brush rolls with remaining brown butter and sprinkle with flaky salt before serving. Recipe created by Tutti Dolci. Thanks for your recipes! They are much appreciated! If I want to make these ahead for a dinner party, where do I stop? Can I refrigerate the dough at some point? Here’s some tips on par-baking and also refrigerating the dough the night before: https://redstaryeast.com/yeast-baking-lessons/postpone-baking/. I hope you will find this information helpful. Curious, what is the reason to solidify the browned butter instead of just letting it cool before adding? The solid butter will give the rolls a different texture than liquid butter. Let us know if you try them!